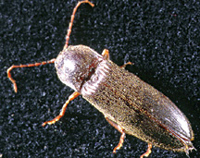 Adult wireworms are called click beetles. Their name comes from the clicking sound they make while attempting to right themselves after falling or being placed on their backs. The larvae of several species of this beetle damage cultivated crops while feeding on underground portions of plants. Wireworms are slender, hard-bodied, wire-like beetle larvae that can damage young soybean plants. They are shiny yellow to brown in color and range in size from 1/2 to 1-1/2 inches (13 to 38 mm) long. 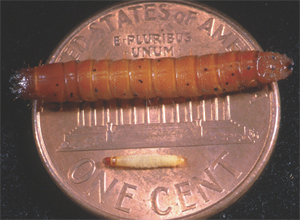 Since the life cycle of some wireworm species may last from 4 to 7 years, larvae may damage several successive crops. Wireworms can feed on and damage one or more portions of a soybean seed or can completely hollow it out, leaving only the seed coat. Wireworms may also cut off small roots or tunnel into the underground portions of young soybean plants. These plants will appear stunted or wilted. Damage to either the seed or seedling can result in gaps in the rows. 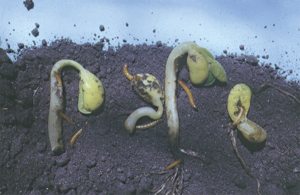 Wireworm damage occurs mainly during the early stages of plant growth. Damage commonly occurs when soybean is planted early and the weather turns cold, slowing germination and seedling growth. Wireworm infestations are usually noted in areas of a field that stay wet for long periods of time and where grassy-type plants are found. Before planting. Soybean fields likely to be attacked by wireworms are those in which sod or small grains were grown the previous year(s), were in set-aside, or which have a history of wireworm damage. Two to three weeks before planting, bait stations should be established in suspected wireworm fields (see bait station). In 5 areas of a field, bury a mixture of untreated corn and wheat seed (a handful of each) 6 inches (15 cm) deep in the soil. 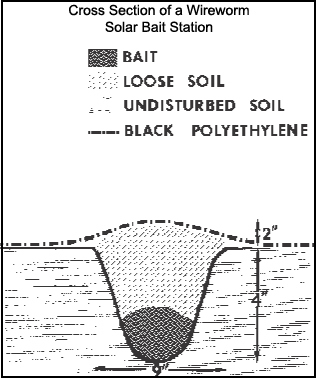 Cover the site with a piece of black plastic to help heat up the soil and mark each site with a flag so that the bait stations can be easily found at a later date. After 2 to 3 weeks, or just before planting, dig up the bait and check the sprouts for the presence and/or damage of wireworms. Another pre-plant sampling method is to dig up a 2 feet long by 1 foot wide by 6 inches deep (60 x 30 x 15 cm), 1 cubic foot (0.03 m3), of soil in each of 5 areas in a field 10 or less days before planting. Place the soil on a piece of black plastic or cloth or 1/4 inch (6 mm) hardware cloth and carefully search through the soil, counting the number of live wireworms found. After planting. If suspected wireworm damage (i.e., wilted plants or gaps in the rows) is found during an early field visit, sample the field immediately. In the area(s) where such damage is found, and in 5 randomly selected areas of the field, dig up a 2 feet long by 1 foot wide by 6 inches deep (60 x 30 x 15 cm), 1 cubic foot area centered over and down the row. Place the soil on a sheet of black plastic or cloth or 1/4 inch (6 mm) hardware cloth and carefully sort through the sample for live wireworms. Also examine the plants for wireworm feeding damage, most notably small, cleanly bored holes at the base of the plants. No soil insecticides are labeled for wireworms as either a planting-time or a rescue treatment in soybean. If an average of one live wireworm per bait station is noted, or an average of one live wireworm per cubic foot of soil using the screening method is found, it is suggested that the field be planted to another crop such as corn and treated with a wireworm-labeled soil insecticide. Replanted soybean may receive an equivalent level of wireworm damage as the original planting so if possible, plant a different crop and apply a wireworm- labeled soil insecticide. Seed treatments only protect the seed, not the seedling, therefore control may be variable with these products. The decision to replant should be based on the remaining healthy plant population, wireworm activity (as soils warm, the wireworms move deeper in the soil profile), the date, yield expectations, etc. Where planting in wide rows, it may be feasible to replant down the middle of the rows without destroying the healthy plants in the original planting. The result would be the equivalent to narrow row soybean. Replanting soybean is a viable strategy, if the wireworms are no longer feeding or have moved out of the primary root zone.